D&H (Druggitt & Harding Limited) (“We”) are committed to protecting and respecting your privacy. For the purpose of the Data Protection Act 1998 (the Act), the data controller is D&H (Druggitt & Harding Limited) of Temple Works, Temple Street, Oldham, OL1 3NJ. Our nominated representative for the purpose of the Act is Glyn Taylor. Information you give us. You may give us information about you by filling in forms on our site druggittandharding.co.uk (our site) or by corresponding with us by phone, e-mail or otherwise. This includes information you provide when you report a problem with our site. The information you give us may include your name, address, e-mail address and phone number. Information we receive from other sources. We may receive information about you if you use any of the other websites we operate or the other services we provide. In this case, we will have informed you when we collected that data that it may be shared internally and combined with data collected on this site. We are also working closely with third parties (including, for example, business partners, suppliers, sub-contractors in technical, payment and delivery services, advertising networks, analytics providers, search information providers, credit reference agencies) and may receive information about you from them. 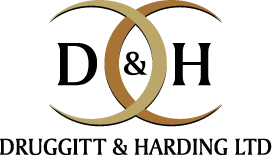 If Druggitt & Harding Limited or substantially all of its assets are acquired by a third party, in which case personal data held by it about its customers will be one of the transferred assets. Our site may, from time to time, contain links to and from the websites of our partner networks, suppliers, contractors, advertisers and affiliates. If you follow a link to any of these websites, please note that these websites have their own privacy policies and that we do not accept any responsibility or liability for these policies. Please check these policies before you submit any personal data to these websites.